LEN - www.lankaenews.com | Rajapakses’ relatives - two ace rogues now hiding in the US after robbing billions caught on camera in Atlanta! 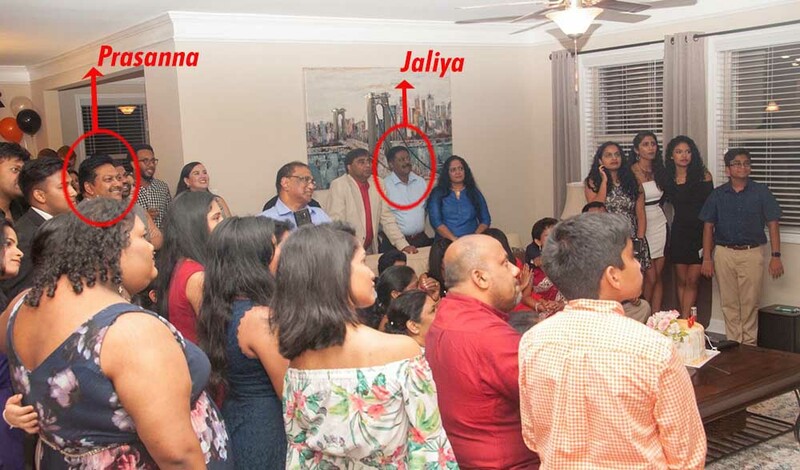 Rajapakses’ relatives - two ace rogues now hiding in the US after robbing billions caught on camera in Atlanta! (Lanka e News – 21.July.2018, 11.45PM) Another two close crooked relatives of the notorious corrupt Rajapakses, namely Jaliya Wickremesuriya the ex Sri Lankan ambassador to US , and Lieutenant Colonel Prasanna Wickremesuriya the ex chairman of Airport Aviation Co. who are hiding abroad evading arrest despite warrants issued on them by courts based on charges of misappropriation of public funds during the nefarious decade of the corrupt Rajapakses were spotted at a party in Atlanta , USA recently. The photo herein bears testimony. It is of course an undisputed universally known fact that while every member of the Rajapakse family is corrupt or a criminal, every other relative of theirs too is a notorious crook . But since many may not know the blood relationship between these two rogues evading arrest and the Rajapakse brigand , we deem that we shall be failing in our duty if we don’t reveal the crooked connections. Kamala Wickremesuriya the youngest daughter of Mahinda’s uncle (father’s elder brother ) D.M. Rajapakse is the mother of the two aforementioned crooks Jaliya and Prasanna. That means crooked Mahinda and his brothers are their uncles. That is , birds of the same feather robbing the country together connection has been confirmed ! The FCID of the police filed a case against Jaliya (a member of Alibaba and family thieves) in the Fort magistrate court , Colombo based on charges of misappropriating US dollars 332,000 during the buying new building for the SL embassy in America in 2008. The SL foreign affairs ministry disbursed US. dollars 6.6 million to purchase a building for the SL embassy in the US , and that transaction was negotiated through a broker. Ceylon Royal Tea Pvt . Ltd . is a company belonging to Jaliya. The ‘P.P. International Pvt. Ltd.’ Co. too had disclosed the sum received by them was also collected back by Jaliya . On 2016-11-17. Jaliya was arrested at the Katunayake airport , and was produced before the Fort magistrate court the following day when he was remanded on the orders of the court. Jaliya who made a request to travel to America to take medical treatment was granted permission by court in 2017 taking into consideration his eye ailment. Jaliya who crept into America deceiving courts and the country never returned to SL. Though a condition was imposed that he should be present in court on 17 th November last year , because he was absconding , an open warrant was issued against him. So Jaliya who robbed public funds to the tune of over Rs. 53.1 Million public funds in broad daylight is now in hiding despite the warrant . Are the law abiding Sri Lankans in Atlanta accepting such an outrageous rogue and rascal ? Prasanna who is the younger brother of Jaliya (in the photograph) is no better. Prasanna was the chairman of Airport Aviation Co. during the most corrupt crooked regime of Rajapakses . Being relatives of equally crooked Rajapakses , like how the Rajapakses fled after driving the country to the brink of bankruptcy , Prasanna too no sooner the Rajapakses were thrown out lock , stock and barrel than he fled to America taking with him all the gold , gems and valuables confiscated by the Customs which were in the safe , after completely emptying the safe. Until today , it had been difficult to finish assessing the massive amount of valuables robbed by this member of the Alibaba and den of thieves. The crucial question is , are the law abiding Sri Lankans in Atlanta accepting these confirmed rogues even after knowing their putrid antecedence ?